“fire”. Pronounced bi / び because of rendaku. Oku Hanako’s new single is finally here! It was released today—actually, yesterday if you want to be technical. Lucky you: you get this week’s song early. For those who don’t know, she made an announcement in late November. It’s been two years since her last single, Cinderella / シンデレラ . 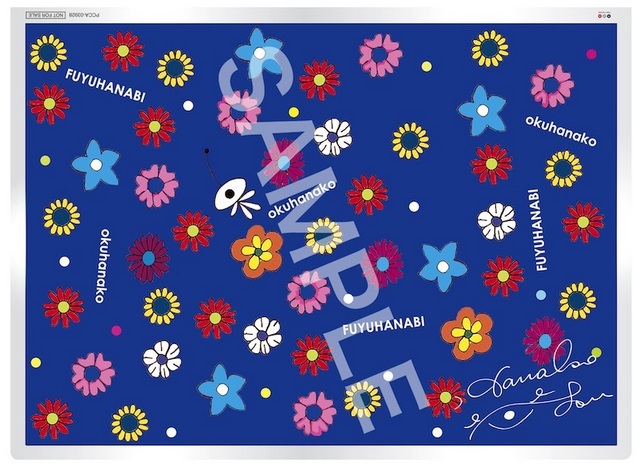 It’s the clearfile (size A5) that was given to early purchasers. Also given out were lottery tickets for attendance to the live event, both given with the purchase of the single. My prediction was right: it is heavily arranged. It may not be as heavy as Anata ni Suki to Iwaretai or Garasu no Hana, but it’s heavy enough for me to count it. When I listen to this song, I can hear elements from all over her discography: it’s mostly reminiscent of Utakata and good-bye, but a touch of vol.best is apparent, too. It’s almost like this is a bit of a summary of what she’s done so far, with some new things to look forward to. With every album, she seems to create a slightly new sound for herself while still keeping true to the overall “Oku Hanako” feel. Hearing Fuyu Hanabi, I don’t think her next album will be an exception. I will be honest, I think that Fuyu Hanabi could use a little more “oomph”. Also, Oku Hanako and the other woman in the music video look a little robotic, almost putting them into the uncanny valley. The song itself, too, has this eerily familiar feel to it, as if someone else in my music library has done something like it, but I can’t seem to “put a finger” to it. Criticism aside, I think it’s a fairly well-done song. I especially like what the strings do after the first chorus, going into the second verse. Now, as to the question of whether she arranged this song herself, I can’t say for sure. It would be very impressive if she did, but there are bits which don’t seem like something she’d do if she did arrange it. We’ll just have to wait until her discography page[jp] gets updated to find out. Update: According to the Japanese Wikipedia article for Fuyu Hanabi, she didn’t arrange it herself. Sorrow, love, will they all disappear? When winter ends, will I be able to smile for the two of you?